Pictures dated from the 1930s of a supposed apeman found in the jungles of Brazil were published in Dutch magazine Het Leven in 1937. His giant lips and furrowed brow and awkward monkey-like gait appear to be simian and Het Leven magazine certainly seemed convinced, describing the pictures as those of a mystery apeman. The internet has been awash with speculation following the appearance of the pictures on the Imgur picture-sharing website two days ago. Since then, millions have seen them on Reddit, Facebook and such like. But what is the real story behind the online excitement? Many observers claim to have spotted tell-tale signs of prosthetic make-up on his face, yet many more seem keen to believe this is historic evidence of an anthropological marvel. Rather than changing the perceptions of scientists across the world, it appears that the apeman’s mouth and brow are stuck into place using rudimentary make-up. Visible in one picture is the line of the prosthetic mouth which covers the chin up to the bridge of the nose. And other observers have pointed out that the forehead will always be covered with hair in any make-up situation to blend in the prosthesis. One shrewd Reddit user pointed out that for a man recently found wild in the jungles of Brazil, he is remarkably well shaven and has a particularly neat, if unfashionable haircut. 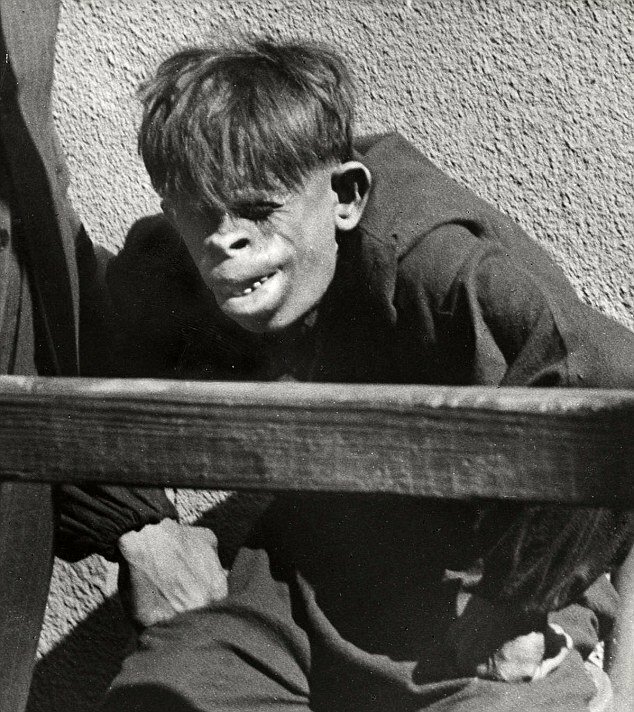 Others online have made the sad claim that this apeman is most likely an unfortunate individual born with birth defects and exploited to wear the make-up and prosthetics to pose and pretend to be a newly discovered apeman. But there are many who may choose to believe in the existence of apemen. Throughout the 20th century and into the 21st, reports of wild and mythic ape-like beasts living in remote and far-flung locations have fascinated readers across the world. One such story occurred in the jungles of South America, when Francois De Loys, a Swiss oil prospector led an expedition along the border between Colombia and Venezuela from 1917 to 1920. While camped in 1920 near the Tarra River, two large monkey-like creatures standing 1.57 metres tall approached the expedition and began howling and gesturing loudly. Fearing for the safety of the group, the male was shot dead and Francois De Loys and his team realized that they had encountered an unusual animal. Despite resembling a spider monkey, the beast had no tail and 32 teeth compared to most North and South American monkeys which have 36 teeth. Propping the creature up with a stick under its chin, Francois De Loys took a photograph and then skinned the creature intending to keep its hide and skull. However, both these items were lost after the expedition encountered serious difficulties leaving the dense jungle. Upon returning to Europe, Francois De Loys did not relate the incident to anyone until 1929, when his friend, the anthropologist George Montandon discovered the photograph while going through the geologists records. Critics immediately pounced claiming that one picture was not enough proof, pointing out that the claim the creature did not have a tail could not be confirmed from the angle of the photograph. Others said that the monkey’s size could not be properly ascertained and that at most the crate it is sitting on is 15 inches tall and that would make the monkey under 4-feet tall, smaller than Francois De Loy’s claimed. On the other side of the argument, cryptozoologists who study hidden or lost animals, see that De Loys Ape has a different chest and hands to other spider monkeys and that it has a much higher forehead. Most ancient cultures across the world have a mythology of an ape-like creature that is neither man nor ape and inhabits wild forests to be seldom seen. The two most famous examples are the Bigfoots or sasquatch of North America and the Yeti of the Himalayas. It almost seems that the expeditions to find either one have match the number of sighting’s and both legends persist to this day. Even in far flung Australia, the Aboriginal people there have their Outback apeman or Yowie, who legend has it stands only five-feet tall to the bigfoot and yeti’s eight.